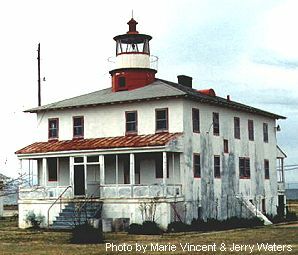 The Point Lookout Lighthouse is located at the mouth of the Potomac River at the Bay and was originally constructed in 1830 as a one-and-a-half story wooden and masonry building. The lighthouse was of little importance to navigation since the lantern was only 24 feet off the ground. It was rebuilt as the two-story present structure in 1883 with the light at 40 feet. A fog bell tower was built in 1872 and upgraded in 1889. In 1951 the US Navy purchased land near the light. The US Coast Guard gave the US Navy the lighthouse in 1966 upon deactivation. The lighthouse had been active for more than 135 years. Currenly the lighthouse is surrounded by chain link fence. It is open to the public only one day a year on the first Saturday in November. In the summer of 2002, the state of Maryland obtained ownership of the lighthouse. A huge restoration project has been started, with plans that include turning the Point Lookout Lighthouse into a museum for the public to view. No date is available for completion on this project. From Rt. 695 Follow to Rt. 97 south to Rt. 3 south (Rt. 3 will turn into Rt. 301. Follow Rt. 301 south. From Rt. 301 south continue to Rt. 4 south in Upper Marlboro. Follow Rt. 4 south all the way across the Solomons Island Bridge. After the Solomons Island Bridge the first traffic light you come to will be Rt. 235. Turn left onto Rt. 235 south. Follow Rt. 235 south into a town called Ridge (there will be a blinking red light). Turn left onto Rt. 5 south. Follow Rt. 5 south as far as it will go (approximately 7 miles) and you will be in Point Lookout. Continue on for 2 miles to the Lighthouse at the end of the road. From Rt. 495 Follow to Rt. 4/Pennsylvania Avenue south to Upper Marlboro. Continue on Rt. 4 south until you cross the Solomons Island Bridge. After the Solomons Island Bridge the first traffic light you come to will be Rt. 235. Turn left onto Rt. 235 south. Follow Rt. 235 south into a town called Ridge (there will be a blinking red light). Turn left onto Rt. 5 south. Follow Rt. 5 south as far as it will go (approximately 7 miles) and you will be in Point Lookout. Continue on for 2 miles to the Lighthouse at the end of the road. Follow Rt. 301 north to Rt. 234 towards Leonardtown. When you reach the end of Rt. 234 at Rt. 5 turn right. Follow Rt 5 south all the way into Point Lookout. Continue on for 2 miles to the Lighthouse at the end of the road. Note that the lighthouse is 1.4 miles past the very narrow causeway that may be underwater at high tide or stormy weather. The lighthouse is only open once a year the first Saturday in November. For more information, call the Maryland Park Service at 301-872-5688.